A low pressure hydraulic system which maintains lower oil temperatures, resulting in higher efficiency and safer operation. Large bore cylinders averaging 3,800 P.S.I. maximum pressure throughout our complete line of H Frame Presses. Working at a lower pressure means less heat and with higher efficiency and most important of all much less risk of liability issues. Most other manufacturers use small bore cylinders at 700 bar equal to 10,152 P.S.I. operating pressure. All our hydraulic and mechanical parts are standard in the industry and available throughout North America. Safety options: Safety standard CSA Z142 is now offered on the H Frame press models. Variable ram speed allows operator to select the proper speed for the task.. Foot pedal-electric solenoid valve for hands-free operation, c/w electric control panel. Front security guard for operator protection. 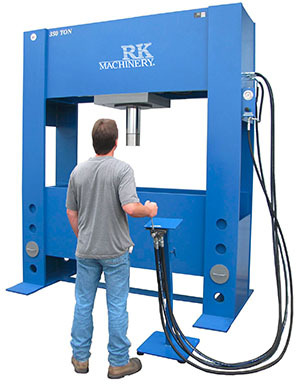 Based on your needs and specifications we will custom build hydraulic presses ensuring that the hydraulic H-Frame press you purchase will help you succeed.